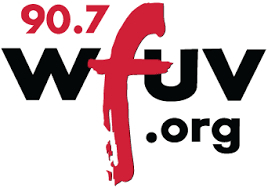 LISTEN to MJ being interviewed by Bob Sherman of WFUV-FM in New York City, broadcast in January of 2018. MJ discusses his history, WoodSongs, the SongFarmers movement and performs several songs. Folksinger Michael Johnathon has a long-standing career in the arts as a songwriter, playwright, composer of the opera, Woody: For the People, and as the host of the live audience broadcast of the WoodSongs Old Time Radio Hour with a radio audience with over two million listeners each week on 500 public radio stations, public television coast-to-coast, plus American Forces Radio Network in 173 nations and now Friday evening on the RFD-TV network nationwide. This ‘Woody Guthrie in a Cyber World’ grew up in upstate New York along the shores of the Hudson River. At 19 years old, he moved to the Mexican border town of Laredo, Texas and found a job working as the late night DJ on a small radio station. One night, he played ‘Turn, Turn, Turn’ by Roger McGuinn and The Byrds. As the song played, he recalled seeing the songs writer, his neighbor Pete Seeger, performing in his Dutchess County hometown in New York. By the time the song had ended, he decided to pursue a career as a folksinger. Michael experienced hundreds of front porch hootenannies where folks would pull out their banjos and fiddles, sit on their front porches with him and play the old songs that their grandparents taught them. Soon enough, he began performing concerts at hundreds of colleges, schools and fairs. He performed two thousand Earth Concerts, plus benefits for the homeless, farm families, and shelters helping battered women and children. In all, he sang to over two million people in one four-year stretch. Now living near Lexington in the foothills of Appalachia, the Kentucky-based songwriter is a prolific artist with twelve released albums, three published books and several national projects. His play Walden: The Ballad of Thoreau has been performed over 8700 times in 42 countries. A tree-hugger at heart, he performed two thousand Earth Concerts at schools and colleges, plus benefits for the homeless, farm families, and shelters helping battered women and children. Billboard Magazine headlined him as an “UnSung Hero” and he has been featured on CNN, TNN, CMT, AP, Headline News, NPR, Bravo and the BBC. Recently, Michael helped organize the national WoodSongs Front Porch Association to help organize rural and community music and a massive educational program. Members of the WFPA are called “SongFarmers,” which is also the title of his recent album, the very first national CD release to be completely recorded on an iPhone. His new 176-page book WoodSongs III is being released September 2017. In addition to his albums, books, concerts and other projects the Martin Guitar Company recently introduced the Michael Johnathon signature model 0000-28s “WoodSongs Quad” guitar. He lives in a log cabin on a hill surrounded by meadows, streams and woods outside of Lexington, Kentucky.